Living for pleasure alone, I like to get along to the movies every few weeks (the Bomber and I are due at Kung Fu Panda next weekend for example). Lately however whenever the curtain goes up at the Odeon I have the four minutes of gibberish above shoved down my throat without even the warning of a Pearl and Dean fanfare. I think I'll have to start turning up five minutes late. Tim Westwood sets the gold standard, but almost every other night time Radio One DJ seems to be a half-wit who was regularly beaten with the ugly stick as a child as well. Trevor Nelson is the only one you could imagine talking to without entertaining thoughts of strangulation. I went along to a Thai Boxing promotion in York Hall last week. Two guys from Jackapong were fighting, so we were supporting them, and they both won by the way, but I was also keen to visit the place itself deep in the heart of East End "knees up" territory whence I seldom venture. York Hall is to boxing what Wembley is to football and Lord's is to cricket. If it were possible to wring out an atmosphere heavy with sweat, smoke and noise, the residue would fill a dozen of the spit buckets that reside beneath the ring's red and blue corner posts. It is said that acclaimed American writer AJ Liebling of the New Yorker made a pilgrimage so that he could sample for himself York Hall's unique ambience. Liebling's countryman, former world heavyweight champion ' Terrible' Tim Witherspoon, flew the Atlantic specially so that he could say he fought in a ring where spectators can almost touch the gloves of the boxers by leaning over from their seats in the balcony. Former world welterweight champion John H Stracey used to jog to his schoolboy fights at York Hall from the family home behind the Blind Beggar pub, infamous for its association with the Kray twins. I saw "Procrastination" the short film above when I took the Bomber to the new Indiana Jones movie. Thanks to the Mini ad for bringing it our way: http://ingredientx.com/ earns a place in the blogroll I think. Everything is changing in the world of moving pictures. There is a new BBC IPlayer in Beta, and you should be able to watch YouTube on your TV with the new Google Media Server. Are we starting to see the outlines of a way that a small player like Lev Yilmaz, the Procrastination animator, could make an independent living via these sorts of tools? I'm going to a garden party at Buckingham Palace in a couple of weeks. Great food, and a fusion of many Asian influences, but a truly terrible website. Follow the links for our real and imaginary destinations as we eat our way around the world in London. To share my room in the house not right in the head. I've seen The Edge of Love. You're not surprised I went to see a film with a Welsh theme are you? Truth be told, in the movie, Dylan Thomas, his wife, and his first love are such vain, self regarding gadflies that I found myself thinking that it would have been no bad thing if the cuckolded Killick's attempted massacre had come off. Dylan: Oh come over by here and give us a hug Cait, my lovely. Give us a shag, there's a good girl. 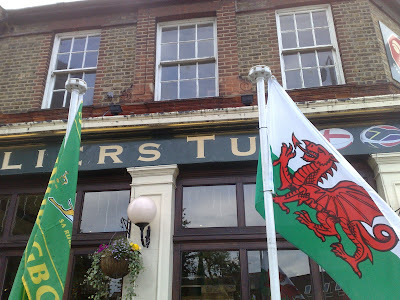 The pub won't be open till lunchtime and I haven't had my jollies since I grabbed Myfanwy between the outhouse and the sceptic tank just after breakfast. Gaggin' for it I am, my darling. Put the baby in the coal house and we'll have a nice bunk up. Caitlin: Go to hell you filthy goat! I'm still flushed after the postman and this pinafore doesn't button and unbutton itself. How do you like this carving knife? Step to me my bass baritone; you'll step back a soprano, and without your tail between your legs mind you. Anyway, where's the gin? Dylan: I have drunk it all my lodestar, my love spoon, my Lilith, my lady. Thirst come, thirst served. All gone it is, but I wrote you a lovely poem. Caitlin: There's a heart melter of a bard you are, Mr Thomas. Rhyme your verse to your Mrs. Thomas. I knocked off another book in what Matt Polly calls the "idiot-participatory-martial-arts memoir category" over the weekend: The Pajama Game. I did judo briefly when I was primary school age. Mark Law - the author - didn't even take it up until take it up until he was pushing 50, and many of the venues in the book, like the Budokwai, are within striking distance of here. Ray Stevens, the Olympic silver medalist (and Brazilian Jui-Jitsu black belt under Roger Gracie) who features prominently has a Wimbledon judo club. It is all rather worryingly tempting. Oh, and it is a good book. Perhaps the "self-deprecating-participatory-martial-arts memoir category" would be more accurate. I'm just trying out the Transport for London Widget above. It's not like I'm having a party or anything. I don't really expect anyone to use the Add This button, I'm just checking it out as I am intrigued. They serve up billions of buttons a month, and give you free analytics providing statistics about how readers are bookmarking and sharing your content. I wonder how they make money? Online maps with crimes plotted on them every month are set to be introduced in England and Wales, Gordon Brown says. The PM was responding to a Cabinet Office report suggesting people felt "cut off" from the justice system. Louise Casey's paper said criminals' punishment needs to be much more "visible" to restore public confidence in the justice system. It is strange now that I have been writing here for a while, how much of the news prompts memories of old posts. I'm not sure that I could remember what I thought three years ago otherwise. At the fifth time of asking we finally won the monthly quiz in the Colour House Theatre last night and walked off with a case of red wine as a prize. I went to see Mrs Eddy there earlier in the week; Christian Science agitprop theatre is a new and hopefully ephemeral category. Back in April I saw Facades. The writer and director asked me what I thought of it. "It is an interesting historical period," I replied diplomatically. Much theatre is pomised in AbbeyFest this year. This is posted from within the Daily Telegraph Website. Update: This is the link. Interesting. Another Update: Apparently Picassa automatically generates an album of all the pictures I upload here. Again, interesting. What can it all mean? Reassuringly symmetrical intentions cannoned through the generations on Father's Day when I gave my Dad a DVD of the Calzaghe/Hopkins fight, and my son gifted me "No Ordinary Joe", Calzaghe's autobiography. I'm glad that he hinted yesterday that a fight with Roy Jones Jr in November is likely to be his swansong. Win or lose against a legend like Jones his legacy as the greatest ever British fighter will be secure. What could he possibly get from a fight with Kelly Pavlik except the chance of an upset? Prediction: Post Calzaghe, Andre Ward will be the next long reigning boss of the super middleweights. (Alex) Haley helped (Quincy) Jones trace his own ancestry: two-thirds African (from Cameroon) and one-third French, Cherokee and Welsh, Jones says. George Washington was an ancestor, but Jones identifies with his African heritage. "Does this look Welsh?" he says, pointing to his skin. Well actually Q, from here it kinda does. The line up for Abbeyfest 2008 is out. We're sponsors again. Come and say hello at the jazz one Friday night. There are good film titles, and then there are great film titles. After last weekend's 43-17 loss, Wales have revamped their team for tomorrow's second Test against South Africa in Pretoria. At least - as the photo above shows - the Colliers Tup has got its priorities right. That was inedible muck and there wasn't enough of it. I've been to a buffet at the Texas Embassy Cantina before, but never made an official eat your way around the world in London stop. That was remedied last night. I had Ribs and Flautas, then Southern Fried Steak. Southern fried steak is "hand battered and fried steak with homemade cream gravy, corn served with fries or mashed potatoes". It is an authentic recipe it would seem, but I thought it was disgusting. Can't win 'em all I suppose. Rooster Cogburn: If ever I meet one of you Texas waddies who ain't drunk water from a hoofprint, I think I'll... I'll shake their hand or buy 'em a Daniel Webster cigar. How long you boys down there been mounted on sheep? Onwards! And follow the links for our real and imaginary destinations. The manufacturers of the Concept 2 rowing machine host a Personal Training Log, and Online World Rankings on the website. You can sign up at http://www.concept2.com/sranking03/log_start.asp. This will allow you to enter and keep track of all of your workouts online and to see a list of your personal world ranking entries. I put my ordinary times in for 500m and 5000m and found myeslf towards the bottom of my peers. No matter, I can now use the Pace Boat facility on the PM3 controllers gradually to work my way up the rankings. It's good for motivation when you know you can be promoted just for turning in a time a tenth of a second faster than your previous entry. Less generously, I wonder what perecentage of the times claimed reflect inflated performances. Anyone fancy joining me up there? Becoming “Training Partners” enables two or more people to view each others' logbooks. There is no limit to the number of Training Partners a person can have. To set up a "training partner", you enter the ranking ID number for the person you wish to have as a training partner into the field provided (your ranking ID number is found in your profile settings) on your Profile page. That person will then see your name appear as a ‘pending’ training partner in their logbook on the Profile page. As soon as your training partner enters your ranking ID number into their log, your partnership is established. Once the partnership is set up - their name will appear on the Profile page along with a link to a modified log page that shows the meters that your partner has rowed - this way you and your partner can keep track of the meters that each other has rowed. Sir Richard F. Burton being an interest of mine, I feel duty bound to promote anything that makes the great man better known. Rupert Everett takes a revealing and witty journey following in the footsteps of one of his great heroes, the infamous Victorian explorer and sexual adventurer, Sir Richard Francis Burton. No doubt I will be rolling my eyes all the way through tonight's show. I predict for example that it will - as almost everyone from Swinburne on has done - present Burton's wife, the formidable and Catholic Lady Isabel, as some kind of hysterical bluestocking. This is nonsense. I take the Mary Lovell line. Then again, perhaps it will be even handed and fine. A few short hours will tell. Reading a review of entertaining sounding "Hellraisers: The Life and Inebriated Times of Burton, Harris, O'Toole and Reed" sent me back decades yesterday to the day that Sean Cashin, a schoolmate, told me - out of the blue as I recall - that his uncle Fergus was ghost writing Oliver Reed's autobiography. I don't recall giving it another thought until I saw a copy of "Reed all about Me" in the local library. I was intrigued enough to borrow and read it, and delighted to find that the middle section - though apparently written in the first person by Oliver Reed - contained several excellent stories of the carousing of one Fergus Cashin which had only the most cursory connection, if any, to the putative author. Nobody ever came into this newspaper business and left a bigger outline on the saloon bar floor than the magnificent Fergus Cashin. He was the grandest, most rip-roaring, one-man riot who ever tripped over the uneven pavements of old Fleet Street. In his day he was the prince of all characters, an awesome giant of fun and fighting and a late-night legend in every joint in the West End that stayed open until dawn. Fergus had given up liquid lunches but not the liquid dinners when I worked with him a decade after he had thrown his final punch in The Street. My first day in journalism was at the Woking News and Mail in the summer of 1986 and at 11-ish the swing door was kicked open, and in walked Fergus. That evening, he invited me for a jar at the office local, The Red House. After that, journalism became fun. Tremendous stuff. Fergus Cashin, a Welsh Born Icon. After my unexpected success with "American Shaolin" I've hit a bit of a lean spell in the book club department with my peers failing to finish - never mind enjoy - both "Crime and Punishment" and "Bombay: Maximum City". I read it last year and by coincidence there's an extract from it in The Times this morning. What about it guys, will you follow Sam Sheridan (and the shade of George Plimpton) as he trains for Muay thai in Bangkok, Brazilian Jiu-Jitsu in Rio, boxing in Oakland and MMA in Iowa? An Amazon reviewer of a previous edition said, "how can someone so obviously intelligent say such dumb things?" significantly, of the 68 titles awarded by the four main alphabet organizations, only 13 were held by American boxers at the end of 2007, while the small Welsh town of Newbridge, with a population of only 9,000, was home to four. It comes courtesy of this piece on Gary Lockett's fight with Kelly Pavlik this Saturday. Myself: I accept that, as an anecdote, it does lack vim and panache; probably not worth pitching to a Hollywood studio then? Good old Radio4: I heard a fine short story written by Ambrose Bierce and read by Stacey Keach yesterday as I was driving back from Basingstoke yesterday. You can listen to it here for the next week (next week I think there'll be another story at the end of the link) or read it below. A woman driving in Belfast city centre saw Robert McCartney being attacked and identified the killer, a court is told. Mr McCartney, 33, was beaten and stabbed to death outside a bar on 30 January 2005 in an incident which soon became prominent worldwide. Sinn Fein has always denied IRA members took part in the killing but his sisters claimed the Provisionals were intimidating witnesses. Of the four people directly involved in the attacks in Market Street, two were IRA Volunteers. The other two were not. Where does this cobblers about always denying IRA members' involvement come from? The family of Belfast murder victim Robert McCartney have rejected an IRA offer to shoot his killers. The IRA said it had given the family the names of the man who stabbed Mr McCartney and a second man who supplied removed and destroyed the murder weapon. Both these men have been expelled by the IRA. Don't BBC reporters read their own files? Can anyone find me an example of Sinn Fein claiming IRA members weren't involved? .. it turns out that about 8 percent of the carbon dioxide in the atmosphere is absorbed by vegetation and returned to the atmosphere every year. This means that the average lifetime of a molecule of carbon dioxide in the atmosphere, before it is captured by vegetation and afterward released, is about twelve years. I'm amazed by this fact. I used to be a chemical engineer, so I could get out my calculator and start messing about with a mass balance, though a trivial daily blog post is not the place to do it. But it really is intriguing, as it implies that the net contribution of CO2 to the atmosphere from human agency is mathematically trivial compared to the carbon volume of the respiration of plant life. The question I would like answered is how much net carbon does photosynthesis remove from the atmosphere each year. Bio fuels must - by definition - be carbon neutral. All the carbon in fossil fuels was fixed from the atmosphere at some time or other so given a long, long perspective everything is carbon neutral. I really need to read and think more about this. 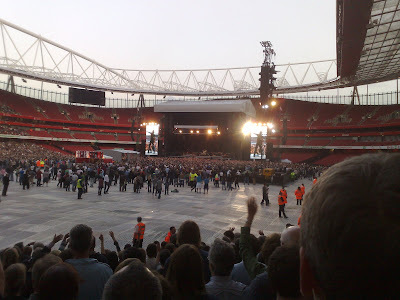 I saw Bruce Springsteen play the first ever show at Arsenal's Emirates on Friday night, and a fine show it was. I'd meant to pack my hip flask so I could thumb my nose at Boris Johnson and his Tube booze ban on the way like these civil rights activists did yesterday. I didn't make it home to get changed and pick it up before I headed North however, as I was stuck in the office dealing with the fallout of SQL injection attacks. They are far more insidious and anti-social than a crafty snifter on public transport. Whatever happened to the Bullingdon Club spirit, old man?